Ukrainian President Petro Poroshenko has signed a decree on the celebration of the 26th anniversary of Ukraine's independence, which, among other things, envisages a military parade in Kyiv. According to the decree, the military parade will take place on August 24, on Hreschatik Street and the Independence Square. An official ceremony for raising the state flag of Ukraine and other events will also be conducted in Kyiv, in other populated areas, and also in Ukrainian diplomatic establishments abroad on August 23, the Day of Ukraine's State Flag. The decree also envisages celebrations on the Independence day in Kyiv and in other populated areas involving representatives of central government agencies, local self-government agencies, lawmakers, fighters for the independence of Ukraine in the 20th century, and participants in the anti-terrorist operation in Donetsk and Luhansk regions. 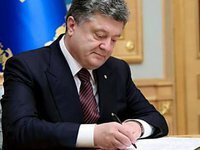 The Interior Ministry, the National Police, the Security Service of Ukraine, and the heads of administrations have been ordered to take measures to ensure public order and citizens' safety during the celebrations of the Day of Ukraine's State Flag and the 26th anniversary of the independence of Ukraine.